A new season (fall in this case) means new lawn tasks that need to be completed in order to maintain a green and healthy lawn. In the fall that means things like raking and mulching leaves. It also means proper watering. The temperatures may start to drop but your lawn will still need a healthy amount of water. Water requirements of a lawn can vary based on the lawn itself and other things such as the type of grass, soil structure and climate. Basic turf generally needs about one inch of water a week. Some warm season grasses will be able to thrive with less than an inch of water. We know that rain is the main supplier of water but the nourishment of the lawn can be aided by a lawn sprinkler system. It’s been a dry year for some areas of the country and that has seen a number of municipalities impose water restrictions. 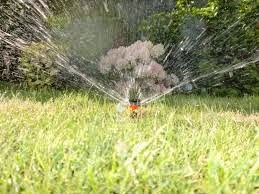 Lawn sprinkler systems do a great job of cutting done on water waste, especially if those sprinkler systems are equipped with a timer. Those timers allow a homeowner to designate the time when the lawn is watered and for how long. This takes a lot of the guesswork out of deciding when to water the yard. The best time to water your lawn is early in the morning. On a hot day, some water from a sprinkler can evaporate before it hits the ground. The sun tends to be less strong early in the morning. Proper watering at set times will help the grass develop a strong root system. Too little or too much water can have a negative impact on this root system. Nobody wants to negatively impact their root system. Remember that overwatering is wasting water. This means a higher water bill and a less-healthy lawn. Overwatering grass can contribute to the development of fungus and disease.